Every aspect of exploring and enjoying this destination is laid out for easy use with step-by-step guides, maps and full directions. 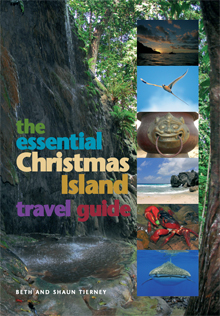 This full colour guide book was originally commissioned by the Christmas Island Tourism Association in 2007 and is the first fully comprehensive guide that as been written about this unique, natural environment. Christmas Island is full of natural wonders: from the unique annual red crab migration to rare and unusual birds and glorious deserted beaches where the only footprints in the sand are those made by nesting turtles. With so many endemic species, the island is often referred to as the Galápagos of the Indian Ocean. Yet it also displays a curious amalgam of cultures, history and industry, emerging as a place where all these elements create a truly unusual travel experience. EDITORIAL | includes history, full tours of the the towns and natural features, suggested touring itineraries and practicalities for visitors. SPECIAL FEATURES | island temples; the annual red crab migration; endemic bird species; marine life; rainforest flora and fauna. ISLAND DIRECTORY | a complete listing of all island services from accommodation and restaurants to weather and airlines.